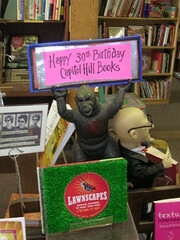 Happy 30th Anniversary Capitol Hill Books! RAWR! KING OF MONSTERS WISH YOU MANY TIME OF SUCCESS! HAVE COPY OF "WHERE WILD THINGS ARE?" 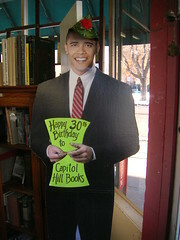 As Capitol Hill Books enters its fourth decade (wow! ), we’ve had a few famous visitors come by to give some celebratory cheer towards our store. First we had Japanese monster sensation Godzilla drop by the store to roar his appreciation for great used books at affordable prices. He even had the courtesy to hold his fire breath until he was outside. "It gives me great hope that you have the audacity to carry a large selection of books with an affordability that all Americans can appreciate." Even though we get an occasional celebrity at Capitol Hill Books, we get a bigger thrill from simply seeing our customers here day in and day out. We have them to thank for the 30-year success of Capitol Hill Books and hopefully its continued success for the next 30 years. January 1, 2010 is our exact 30th year in business. We will have a few cookies and warm stories to share if you would like to come in on that day. And of course you are welcome to come by after then too. We plan on staying here awhile. This entry was posted in Uncategorized and tagged 30 years, anniversary, Capitol Hill Books, celebrities, Community, Denver, Godzilla, happy birthday, Obama. Bookmark the permalink.